A Russian anti virus vendor has alerted the mac community that Apple Mac’s are far from immune to security issues as the site Dr.Web claims that over 550,000+ computers are now infected with a Trojan horse that apple have finally patched up last week. *note the advice is to update your O/S now. The Trojan which goes by the name of: “BackDoor.Flashback.39 trojan,” is easily installed onto unsuspecting macs. 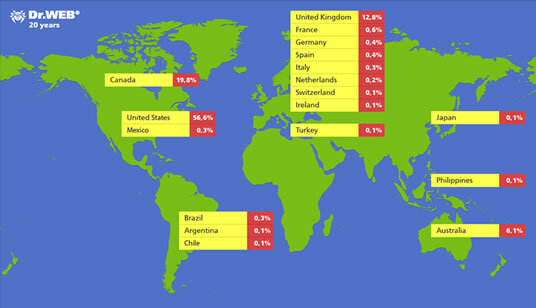 It would appear that close to 80% of computers that are affected are from North America with the U.S at (56%) and Canada at (20%) and the UK coming in at around 13%. Most other countries such as Japan and Australia as well as the rest of Europe are suspected to have infection rates below 1%. With most affected websites coming under the .nu domain (that famous island of “Niue” of course) and with URL’s spanning many niches and interests but often related to movies and TV streaming services, there is a chance that you could be among the victims. The Trojan works by saving an executable file (an application I assume, rather than a notorious .exe file which would not work on a mac)….onto the hard drive of the affected mac, this is used to download a nasty payload from a remote server which then launches the application. But, I hear you say, Macs are much safer than Windows PC’s as they have a barrier of protection via a password layer that needs to be input prior to any new software being installed. Well passwords are great, but if you are unsuspecting then you are likely to simply input this especially now that so many believe that Apple devices are somehow impenetrable to Trojans and such like. I am slightly unclear as to what the different outcomes are but that is all I could find on the password issue. How do we know the figures of infection? Using “terminal”, F-Secure have released a set of instructions that should help mac owners find out of they have been compromised by this Trojan and hopefully remove it. Motivation of commercialism could be telling? As far as I am concerned, whatever the true figures are I can see that Mac’s will come under more scrutiny from hackers and malware creators for the simple fact that Mac’s are growing in popularity and owners are a bit slack on security due to a perceived invincibility to this kind of attack. As this case highlights, all it takes is someone to offer you a crappy TV streaming service that requires an application to be installed, or such like, and many Mac owners will simply go ahead and forget that they could be installing something more nasty, as in this case it seems. What do you think of the Mac Trojan issue, do you still feel that Mac’s are more secure or is this a time bomb ticking away with more nasty surprises on the horizon?